For information about our LSPA LCP Review Study Course, please contact our LCP Review Course Chair at LCPReview@la-paralegals.org. ". . . Except in Louisiana . . ."
The LCP examination will not be offered Spring 2019. Changes are coming! The Louisiana Certified Paralegal exam was administered for the first time on October 3-4, 1996, in Baton Rouge and Alexandria. Eleven examinees sat for the October 1996 examination. Louisiana is one of many states in the United States that does not have a definition or any regulations concerning paralegals or legal assistants. The Louisiana State Paralegal Association Certification Committee was reactivated in 1991 with the goal and responsibility of addressing the question of paralegal credentials, following a 1989 survey of the membership. At its 1992 annual meeting, LSPA held a Certification Symposium. The membership passed a resolution that endorsed voluntary certification as a means of establishing professional standards and promoting recognition of the paralegal profession. It also declared that voluntary certification is preferred over mandatory or other voluntary methods of accomplishing voluntary certification, either national, state-specifc, or both, with a requirement for continuing legal education to maintain the certification. Subsequently, LSPA determined a state voluntary certification credential should be developed and made available to all Louisiana paralegals who desire to demonstrate a comprehensive knowledge and a high degree of proficiency in Louisiana law and adherence to a Code of Ethics to enhance the quality of paralegal services available to the Louisiana legal community and to the public it serves. Paralegals should maintain control of their own destiny. The participation of attorneys, paralegals, and paralegal educators from around Louisiana was sought from the outset of the examination concept, and individuals from all three professions participated in examination development. Examination development sub-committees were formed with representation from each of LSPA's eight regions. Panel discussions were held in various locales to obtain the input of the Louisiana legal community, and a statewide forum was sponsored by the Baton Rouge Paralegal Association. The goals for a valid Louisiana certification examination that were developed as a result were: (1) paralegals should retain control of their own destiny; (2) the examination should meet the standard of voluntary certification, that is, it should not be mandatory for a Louisiana paralegal to obtain the credential to enjoy employment as a paralegal in Louisiana; (3) the examination would be in accord with LSPA Resolution 92-1; (4) the examination must not conflict with LSPA's National Association of Legal Assistants affiliation; (5) the examination should be the in the best interests of the LSPA membership and other Louisiana paralegals insofar as those interests could be determined; (6) the examination should be accessible to Louisiana paralegals regardless of where in Louisiana they live and work and regardless of their economic means; (7) the examination should test core paralegal skills that every paralegal, regardless of the area of practice, must possess and demonstrate a comprehensive knowledge of the Louisiana legal system and judicial system, civil procedure, ethics, and Louisiana substantive law, as well as knowledge of the American legal and judicial system, and federal substantive law. The resulting certification program requires the candidate to sit for both the LCP examination to test the examinee's knowledge and understanding of the Louisiana legal and judicial system (general law), ethics, civil procedure, and four areas of Louisiana substantive law, selected by the applicant from those offered, and the Certified Legal Assistant examination offered by the National Association of Legal Assistants, Inc., which tests the core paralegal skills, knowledge of the American legal and judicial system, and four areas of substantive law based on the federal law and common law principles selected by the applicant from those offered. The LCP exam is given over a two-day period and tests on three required sections: general law (state court structure, including jurisdiction, and duties of those officials who work inside the court system, etc. ); civil procedure, which is much broader in Louisiana than litigation only, although it includes litigation; and Louisiana legal ethics. In addition to the required sections, applicants are required to choose four substantive law topics on which to be tested from a list of eight: property; wills/probate/successions/trusts; criminal law and procedure; evidence; torts; family law; obligations (contracts); and business organizations. Category 1: You must have graduated from one of the paralegal programs that is approved by the American Bar Association or an associate degree program or a post-baccalaureate certificate program in paralegal studies or a bachelor's degree program in paralegal studies or a paralegal program that consists of a minium of 60 semester hours of which at least 15 semester hours are substantive legal courses. Category 2: A bachelor's degree in any field plus one year's experience as a paralegal. Category 3: A high school diploma or equivalent plus seven years' experience as a paralegal plus a minium of twenty hours of continuing legal education completed within a two-year period prior to application for the examination. Continuing education is important in the legal field. The LCP is granted to individuals for a period of five years, and if the Louisiana Certified Paralegal submits proof of continuing legal education in accordance with the requirements, certification is renewed for a five-year period, and the process begins again. All Louisiana Certified Paralegals must maintain their Certified Legal Assistant certification in good standing. To maintain certification as an LCP requires 2.5 units of Louisiana substantive and/or procedural law and .5 units of ethics in each five-year period, which units may, at the discretion of NALA, also fulfill a portion of the 5.0 units of continuing legal education required to maintain the CLA. LSPA is proud to be an Affiliated Association of NALA. 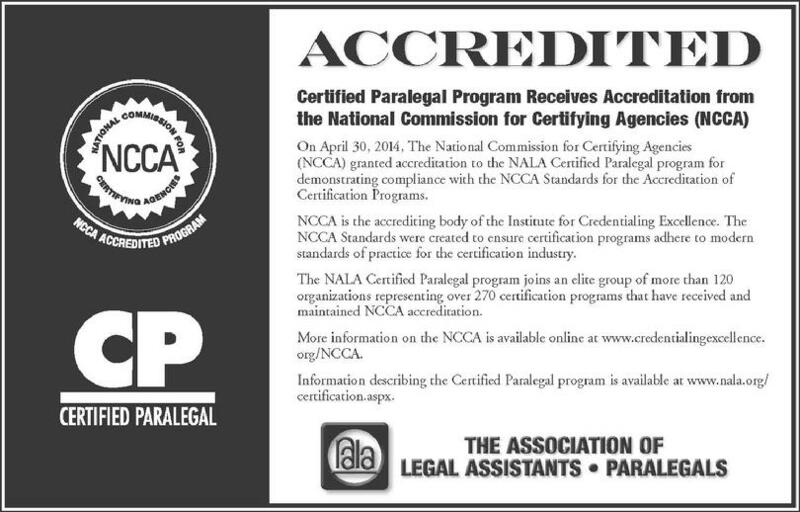 NALA has many benefits for paralegals including the Certified Paralegal (CP) and Advanced Certified Paralegal (ACP) credential program. LSPA chose to link the CP exam to the LCP exam because it tests core paralegal skills, knowledge of the American legal and judicial system, federal law and common law principles. Since 1976, NALA's credentialing program has established high standards of excellence and national recognition. There are currently over 18,000 Certified Paralegals.